The world’s third largest democracy, Indonesia, is preparing to go to the polls once again. 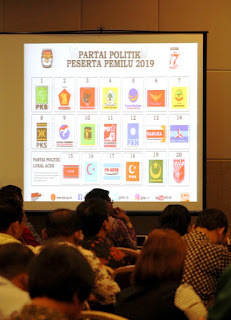 On 17 April 2019, Indonesian’s will vote in the next national legislative and presidential elections. This is the first time that parliamentary and presidential elections will be held on the same day. There are two candidates for president. The current President Joko Widodo (‘Jokowi’) is running with KH Ma’ruf Amin, the chairperson of the Indonesian Ulama Council and of the world’s largest Islamic organization, Nahdlatul Ulama (NU). Against them are Prabowo Subianto, a former general of the Indonesian armed forces, and Sandiaga Uno. Prabowo previously contested the 2014 presidential elections and lost to Jokowi, a result he disputed in court. There are competing factors at play in the upcoming 2019 elections. There have been changes to Indonesia’s electoral laws, as has been the case prior to every national election since 1999. This time, 15 parties have been approved to run in the national elections. In 2017, there were also simultaneous local elections (known as pilkada) held across a large number of regions. The former mayor of Jakarta and Jokowi’s former running mate for mayor, Basuki Tjahaja Purnama (known as ‘Ahok’), lost the Jakarta gubernatorial elections after his popularity was affected due to mass mobilization on accusations of blasphemy. Ahok is a Chinese and a Christian, considered to be a double-minority in Indonesia. He was later found by a court to be guilty of blaspheming Islam and remains in jail. The upcoming elections have therefore raised important questions not only about electoral laws, but also about religion, race and money politics in Indonesia. This conference will bring together a distinguished group of academics to discuss the law and politics of elections in Indonesia. This event is hosted at the University of New South Wales Law School by Dr Melissa Crouch and is organized in partnership with the International Institute for Democracy and Electoral Assistance (IDEA), the Indonesian Election Commission (Komisi Pemilihan Umum, KPU) and the Indonesian Elections Supervisory Agency (Bawaslu).